On Sunday morning, just hours before he scrambled on to the roof of Harriet Harman's home dressed as a superhero, Mark Harris kissed and hugged his daughter Lisa and set off from the South Devon home they share. 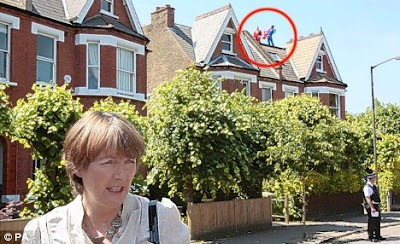 In the end, Mark, who staged his weekend protest with fellow Fathers 4 Justice campaigner Jolly Stanesby, stayed on the roof of Ms Harman's elegant period home in Herne Hill, South London, for ten hours - an hour for every year that his own case wasn't resolved by the courts. When he climbed down on Sunday night, he was immediately arrested and detained by police, leaving Mr Stanesby perched precariously on the slates, stubbornly insisting he wouldn't descend until Mark had been released. But then as Lisa points out, brushes with the law are nothing new to her 49-year-old father. During the decade he spent fighting for full access to his three daughters after his wife walked out and took them with her, the driving instructor faced 133 court appearances before 33 different judges, two stints in jail and went on a hunger strike. The irony is that Mark's case is now resolved: Lisa, his eldest, now lives with him. So does his 17-year-old daughter. Another daughter, aged 15, lives nearby with her mother, but visits at least twice a week. He now has everything he fought for. But he still donned Superman's leotard, tights and cape because while he is free to talk about the horrors he suffered at the hands of the British justice system, other fathers are not. Last year, the Lord Chancellor ruled that family court proceedings must remain secret and therefore, argue some, unaccountable. If it seems strange that Mark is still angry about his own ordeal, then as Lisa is quick to remind anyone who asks, until she was 16 - and legally able to choose for herself which parent she wanted to live with - she hardly knew her father at all. Her life has been blighted by years of enforced separation from the father she clearly adores. Lisa, too, has suffered. For years, she believed her father had abandoned her and couldn't understand why. There are many gaps in their shared pasts, but one memory they both recall vividly is how, on the day Lisa returned home to her father she walked into her bedroom and threw out all the toys and mementoes Mark had clung on to from her childhood, laughing nervously as she did so. And despite her bravado as she threw away the dolls and teddies, Lisa admits that, in fact, her heart was breaking. With their comic book character outfits and off-the-wall publicity stunt protests, it would be all too easy to dismiss the Fathers 4 Justice phenomenon out of hand. The group formed in 2002 and champions the reform of Britain's family law system and equal parenting rights for separated couples. It doesn't help, of course, that many of the group are legally prevented from speaking out and defending themselves. And yet the personal story behind the group's latest desperate attempt to be heard is a salutary reminder that when family decision-making is handed over to the State, families can be ripped apart. As Mark pointed out, he didn't walk out of his children's lives. He was ordered out by the secretive family courts. And when he objected, insisting upon his right to see them, he found himself on the wrong side of the law. He married a former driving school pupil in 1986 after a whirlwind romance and Lisa was born the following year, her younger sisters arriving in 1989 and 1991. Back then in those heady days of early fatherhood, he could never have imagined that he would one day end up on national television protesting on top of a minister's home. He was, he said, a 'hands-on' father and aside from regular rows about his 'overbearing' mother-in-law, he thought his marriage was happy too. His wife, however, clearly didn't agree. One day in November 1993, he returned home to find the four-bedroom family home in Plymouth ransacked. Most of the furniture and ornaments, as well as his wife and children, had gone. 'Later, she calmly explained that she no longer loved me, but that I could see the children whenever I wanted,' he said. 'She seemed so cold and uncaring - I didn't recognise her. Over the next two months, Mark saw the girls nearly every day. Then, one day, two months after she had left, his wife asked if she could speak to him. Life soon became a round of court appearances. At first, Mark was granted unrestricted access. But at the same time his wife applied to have his visits reduced, saying it was ' confusing' for the girls to see him. The Family Court agreed and cut his access from three times a week to once a week and finally to once a fortnight. A year after they separated, the couple divorced. And that year, 1996, Mark returned to court in a bid to see more of his daughters. This time, he asked if they could come and live with him. His wife retaliated by saying that seeing him was unsettling the girls. The judge's response was astonishing by any standards: he severed all Mark's rights of access. 'I was devastated,' he said. 'But I couldn't let that stop me being a father to them.' To show he cared, he stood on the street and waved to them when their mother drove them to school each morning. His ex-wife took out an injunction to stop him. Still he carried on waving at his children. 'I thought the whole ridiculous business would be cleared up at the next court hearing,' he said. On his first night in jail, he shared a cell with a murderer. 'I pined for my girls,' he said. 'When I got out, it took me another year to convince the courts that I should be allowed to see the girls at all.' Finally, five years after being separated from Lisa and her younger sisters, Mark was granted permission to see them under the supervision of social workers. At first, Lisa refused to come, convinced that he hadn't seen her for so long because he didn't love her. Then, in January 2001, at a court hearing he hoped would increase his children's visits, he was sentenced to ten months in Pentonville Prison for contempt of court. His crime? Driving past his wife's house, trying to catch a glimpse of the girls between the six unsupervised visits he was allowed each year. He went on hunger strike for two weeks. In the end, it was Lisa, not the courts, who resolved the situation-Over the years, she admits, she had given up on her father. 'We thought he didn't love us any more,' she says. Over the years, she occasionally saw her father on TV. 'One day, I caught him being interviewed along with some other dads who were also banned from seeing their children,' she says. On March 21, 2001, she telephoned her father out of the blue, saying that she and her youngest sister were at a bus stop with their bags packed and wanted to come and live with him. 'Seeing Lisa again for the first time in six years was incredible,' recalled Mark, who has written a book, Family Court Hell, about his experiences. Yet there is lingering regret too, for herself and for others who have to experience a similar ordeal. 'I wish to God that my parents had avoided the courts from day one and simply shared us, the children they created together,' she says. 'Instead, complete strangers were allowed to get involved in our lives to such an extent that everyone lost sight of the needs of us, the three people they were fighting over. All I ever wanted was to be allowed to love them both,' she says. Harriet Harman may have been justified in refusing to meet this weekend's uninvited house guests and listen to their complaints, but, in the end, Lisa's words say it all.